As part of my ongoing rehabilitation from my broken elbow, I have been playing bass . No really, the consultant actually said it was a good way of stretching my tendons and muscles and measuring progress. 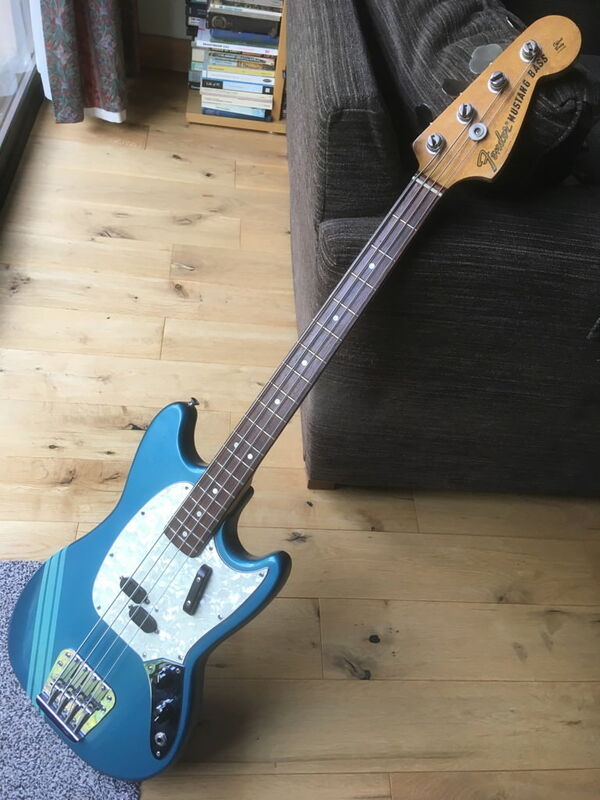 I had one of those 'Pawnshop' versions with the humbucker recently - I didn't really get on with it, it was quite heavy and felt 'lumpy' due to having a full P-Bass thickness body, and the sound was a bit dull. The Mustang is meant to be thinner, and this one feels and sounds far better - the little pickup sounds great and not 'small' at all. If anything it's surprisingly like a Rickenbacker - quite bright and piano-like, so I can completely understand why several of the well-known Rick players of the early 70s also used Mustangs. The balance is also very good despite the small body and short upper horn - the neck is set so deep in that the front strap button is still beyond the 12th fret, which is ideal for me even as I am normally - I have short arms and any more of a reach to the first fret than that starts to get awkward. The worrying thing is that I like it so much I'm not sure I'm in that much of a hurry to recover and play my 4001 again . Cor, I like that a lot.